A Species Action Plan for the Critically Endangered Madagascar Pochard, covering the period 2014-2024, has recently been published. This was based on an action planning workshop that was held with key project partners and other stakeholders from 3-6 December 2013 in Antananarivo, Madagascar. 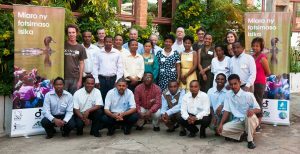 The workshop was the first of its kind in Madagascar, following IUCN guidelines and with the full participation of representatives from the local community level to national government and international partners. Stakeholders included representatives from local communities near the remaining wild population in Bemanevika and the potential release site at Lac Sofia. The workshop was opened by Mr Richard Lewis (Director, Durrell Wildlife Conservation Trust Madagascar Programme) and Madame Sahondra Rabesihanaka (Chef du Service de la Gestion de la Faune et de la Flore, DVRN/DGF/MEEF). The workshop was facilitated by Dr David Mallon (IUCN Species Conservation Planning Subcommittee) and Ms Domoina Rakotobe. 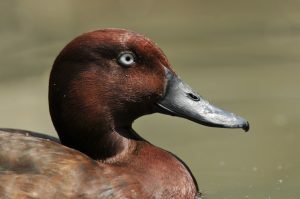 The Madagascar Pochard is endemic to Madagascar and is believed to have once been relatively widespread across the country. Widescale and severe environmental degradation in Madagascar has caused extensive loss and degradation of wetland habitats and declines in waterbirds. Major threats include sedimentation from the increased erosion following extensive deforestation, conversion of wetlands to agricultural land, hunting, by-catch from fishing practices, and introduced species. A population of just 25 Madagascar Pochard remains, restricted to four small lakes near Bemanevika, an Alliance for Zero Extinction (AZE) site in the north west of the country. A captive population was established in 2009 to prevent imminent extinction and with the intention of releasing captive-bred birds in the future. The captive population numbered 84 birds in 2016. Research on the wild birds has been initiated, but knowledge of the species’ ecology and threats remains limited. Lake Sofia, c. 50 km from Bemanevika, has been identified as a potential release site. The action plan identifies the key actions required to improve the conservation status of Madagascar Pochard. A range of stakeholders – including researchers, conservationists, authorities and local communities around the lakes at Bemanevika and Sofia – identified the threats to the species and determined a series of actions to remove those threats or mitigate their effects. The plan’s Vision is that populations of Madagascar Pochard are increasing and restored and thrive in healthy, well managed ecosystems, involving local communities and other stakeholders, contributing to sustainable development and being a source of pride as a flagship species for Madagascar. 2. Ensure that each stakeholder benefits from the conservation of the Madagascar Pochard and the sustainable management of its habitats. 11. Effective implementation of the strategy is ensured through consistent review. A series of actions are identified in the plan to deliver each of these objectives, and authorities and stakeholders are encouraged to work collaboratively to implement them. A review of the plan is scheduled to be undertaken midway through the plan period, based on an improved understanding of the species’ requirements and the impact of threats upon the species and its habitat. You can download versions of the plan in English and in French. With thanks to Glyn Young at Durrell Wildlife Conservation Trust for this news item.